It’s the future, year unknown. The world’s gas has run out, the environment has collapsed, and the nuclear apocalypse has come and gone. In the middle of this desert hellscape, we find Max (a laconic Tom Hardy, replacing Mel Gibson in the title role). Almost the moment we realize it’s Max, standing beside his supercharged black Pursuit Special, he’s hunted down and captured by a raiding party from The Citadel, a rare oasis of green, water, and life ruled by the maniacal Immortan Joe (Hugh Keays-Byrne). Max has no more value to Joe than a “blood bag” for transfusing one of his dying War Boys, a simple but fervent youngster named Nux (Nicholas Hoult). But when one of Joe’s best Imperators, Furiosa (played with fatalistic determination by Charlize Theron), hijacks a War Wagon and escapes with his prized Breeders (read: pretty wives undamaged by radiation and mutation), Joe mobilizes his entire army in a ferociously kinetic off-road chase to bring them back or die trying. Leading this insane charge, of course, is Nux. And leading Nux’s vehicle as a shackled hood ornament… is Max. Now, a bit of personal background: I’ve been involved in the film industry for nearly twenty years. I’ve seen many thousands of movies, studied them, broken them down to see what makes them tick. I’ve written about them here on The Bits and elsewhere, reviewed them, even met their directors in some cases. I’ve written numerous screenplays of my own. What all of that means is that it’s rare that a film like this genuinely surprises me, much less completely knocks me off my feet. Yet that’s exactly what George Miller’s Mad Max: Fury Road has done. Despite the fact that it’s a sequel of sorts, the film manages to seem original and to create a unique, fully-realized world. Its story feels honest, its victories well earned. While its characters aren’t exactly deep, they’re compelling. Hardy’s Max becomes almost a passenger in his own film, riding shotgun to Theron’s Furiosa, but that’s okay because it’s not what you expect – it gives the film a fresh edge. Best of all, Miller and his team have fully grounded that edge in a strange and wonderful kind of reality. After a decade and a half of bloated CG genre epics, films like Fury Road (and the forthcoming Star Wars: The Force Awakens) represent a countermovement; a shift back to the use of fully practical stunts and effects as the core element of nearly every shot. CG is used to enhance, not create. This is good but what’s so surprising is that, in doing so, Miller has not only managed to top the most outlandish of those digital epics, he makes you believe it. There are set piece action beats in this film so ingeniously crafted and visually outrageous, they leave you speechless. I first saw this film with a group of friends, jaded industry professionals all, at an opening night IMAX Laser 3D screening at the Chinese Theatre in Hollywood. We were, all of us, blown away. I’m not ashamed to admit that I may very well have squealed with glee the first time the camera panned over The Doof Wagon, past its crew of frenzied drummers, to reveal The Doof Warrior himself, blazing away on his flame-throwing thrash metal axe guitar. I mean, seriously. Isn’t that the appropriate reaction? When you see something like that for the first time, your brain’s frontal lobe just goes “WTF? !” and shuts down. And the film’s high-speed “Pole Cat” attack on Furiosa’s War Wagon? Pure genius. Or madness! Maybe it’s both at the same time. I don’t know, but I’ll tell you this much: Never did I suspect that you could cross a demolition derby with the Cirque du Soleil, choreograph it into a kind of exquisite cinematic ballet, add gas bomb explosions, and then elevate the result to an almost operatic level of pure action film perfection. Never, in my wildest dreams, did I think that was possible. But it is. Michael Bay wept. The audio is available in a fantastic English Dolby Atmos mix that’s 7.1 Dolby TrueHD compatible. This is one of the most immersive surround mixes I’ve experienced in recent memory, both in the theater and at home on Blu-ray. The soundfield is big, wide, and deep, with smooth, active panning, and head-turning directional effects. The dynamic range is tremendous, from the quietist whispers, to growling V8s, to gut-punch explosions, all of it interwoven with Junkie XL’s pounding score. There’s also English Descriptive Audio, as well as 5.1 Dolby Digital audio options in French, Spanish, and Portuguese. Subtitles are included in English for the Deaf and Hard of Hearing, French, Spanish, and Portuguese. Unfortunately, the Blu-ray isn’t exactly loaded with special features. Essentially, you get 6 behind-the-scenes featurettes adding up to about 92 minutes worth of documentary material. 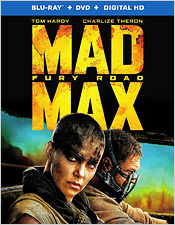 It starts with Maximum Fury: Filming Fury Road (28:38), which is a solid but glossy look at the film’s production, from the storyboard process, to planning and logistics, stunt coordination, filming, and the rest. The highlight is a look at the shooting of the film’s big set piece stunt sequences. Quick interview clips with all the key cast and crew members are included. Mad Max: Fury on Four Wheels (22:37) offers a closer look at the design and making of the many custom cars and vehicles seen in the film. The Road Warriors: Max and Furiosa (11:18) is an examination of the two lead characters, featuring interview clips with Hardy, Theron, and Miller. The Tools of the Wasteland (14:26) focuses on production design, covering the film’s kit-bashed and repurposed props, costumes, and set dressings, all of which were guided by Miller’s insistence that, even in a post-apocalyptic world, people would still strive to make beautiful, artistic things out of whatever they had. The Five Wives: So Shiny, So Chrome (11:11) is rather a negligible piece on the five young actresses who play Immortan Joe’s fugitive wives. And Fury Road: Crash & Smash (4:02) is a nifty vehicle stunt sequence cut together from 100% real and unenhanced test video and footage shot on set. There’s also a trio of deleted scenes (I Am a Milker – 00:32, Turn Every Grain of Sand! – 01:49, and Let’s Do It – 00:59). These are really just quick moments and don’t add anything to the story, so I’d say they were wisely deleted. Still, it’s nice to see them here. Finally, you get a DVD copy of the film and a code for an UltraViolet digital copy. On the whole, the set’s extras are mostly quite good. There’s just not nearly enough. I wish the Blu-ray included audio commentary tracks, a better examination of the film’s story universe, a look at the cinematography, the music, the sound design. There should be packed galleries here full of storyboard images, production photos, and design artwork, and of course trailers and promotional material. Someone, someday, is going to do the really elaborate special edition that this film deserves. Because this is not it. But while it’s not the ultimate edition we’d prefer, the A/V portion of this Blu-ray is truly reference quality. Most importantly, this film represents a mic drop moment in the history of action cinema. George Miller, at age 70, has just schooled every other director working today in the fine art of practical-effects action filmmaking. Mad Max: Fury Road can quite justly lay claim to the title Best Action Film Ever Made and it damn well might be the best film of 2015. It’s weird, wonderful, completely over-the-top… and absolutely not to be missed.